Trump’s offensive and ridiculous comment that Mexican immigrants are rapists, drug dealers and criminals did not play well in Panama. And, on the eve of an enormous trade deal between Panama and Mexico going into effect, I don’t think it was a difficult decision to pull out of the event. In the meantime, Trump’s name is on the tallest building in Latin America, Trump Ocean Club, which happens to be a key part of the Panama City skyline. The fallout continues over Donald Trump‘s controversial remarks about Mexican immigrants continues, with Panama becoming the latest country to drop out of the Miss Universe pageant. The Miss Panama organization and the Telemetro television channel announced Friday that they won’t participate in or broadcast the Miss Universe contest this year. The move, they said in a statement, is a “message of solidarity for our Mexican brothers and sisters” after Donald Trump’s recent description of Mexican immigrants as rapists and as people who bring drugs and crime to the United States. Panama, which hosted the pageant in 1986 and 2003, joins contest organizers and broadcasters in Costa Rica and Mexico, who have also have pulled out of the event. The backlash began shortly after Trump announced his latest presidential bid. During his announcement speech, he laid out his stance on immigration reform. Soon after, Univision and NBC, which broadcast the annual contest along with Trump’s Miss USA pageant, announced it was severing ties with the billionaire. Trump responded by filing a $500 million lawsuit against Univision last week. “As one of only a few independent networks, we decided to exercise our own voice and committed ourselves to bringing this pageant to American viewers everywhere,” Reelz CEO Stan E. Hubbard said in a statement. “Dancing with the Stars” Cheryl Burke and MSNBC anchor Thomas Roberts have bowed out but Jeannie Mai has vowed to stay. Originally, there were five judges slated for Sunday’s telecast of the pageant, HGTV star Jonathan Scott, country singer Jessie James Decker, E! News anchor Terrence Jenkins, TV host and former Miss Universe winner Zuleyka Rivera and Hall of Famer Emmitt Smith. All but one have dropped out. Only Decker’s name remained listed on the Miss USA website. 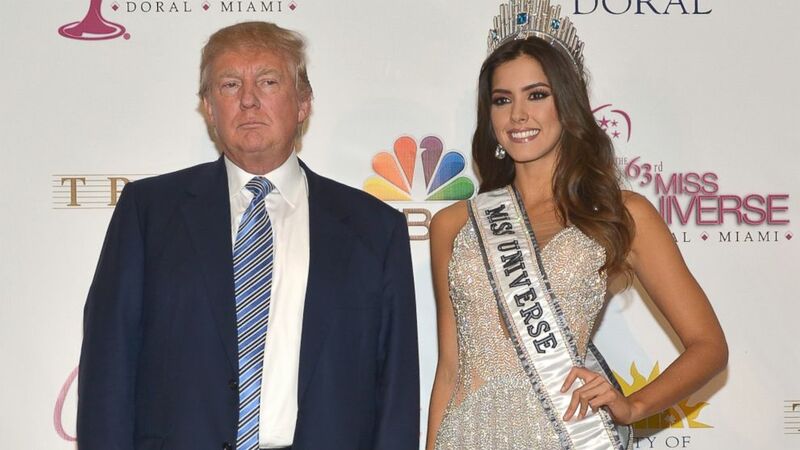 The current Miss Universe, Paulina Vega of Colombia, added her condemnation of Trump’s remarks, calling them “unjust and hurtful” but said she wouldn’t be giving up her crown despite pressure to do so. “If the Miss Universe Organization shared any anti-Latin sentiments or any type of racial biases, I wouldn’t be in this position today,” Vega wrote on Instagram.